Taryn rides a sweet Gazelle. Click on any of the photos here to be redirected to the original image with caption information on the Bike Fancy blogspot. 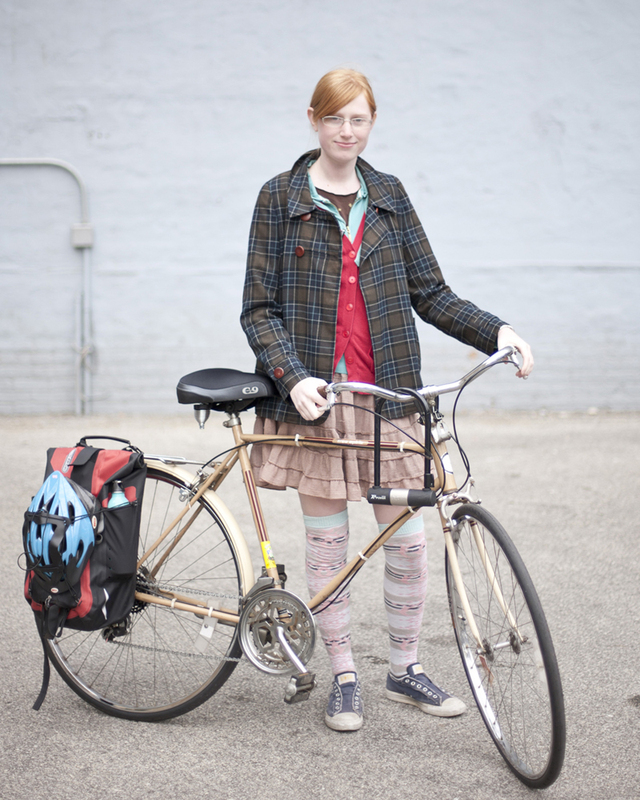 If you have not already seen it, Bike Fancy is an awesome new female-centric cyclechic photo blog out of Chicago. Professional photographer Martha Williams is the creative force behind Bike Fancy, and I have copied and pasted a few of her fabulous photos of present day Chicago Bicycle Girls into Over the Bars for your viewing inspiration. Rachel, effortless and timeless style. 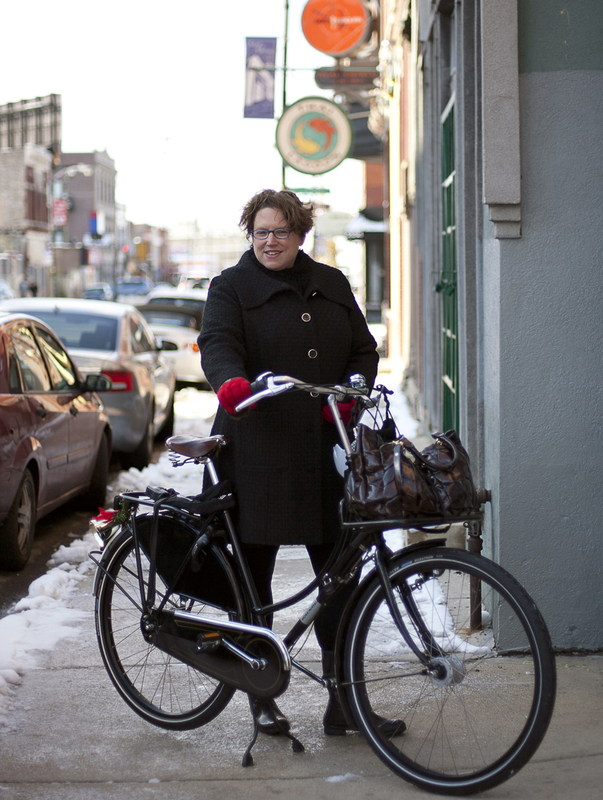 What I like so much about the photos on Bike Fancy is how they portray the diversity of independent styles among this group of visually strong women unafraid to ride bicycles in an urban environment. Certainly Martha’s skill as a photographer has a lot to do with the power of the compelling images, but lurking beneath any stereotypical marketing/advertising elements of attractive women in photographs lies the culture-changing power of strong, fearless females doing something because it is fun, healthy and convenient … think Susan B. Anthoney for the present day. Are you biking fancy in Milwaukee? If you are and want to appear in Over the Bars, email me at overthebarsmke (at) yahoo.com to set up a photo shoot. Samantha clearly gets me, and she doesn't even know me. OTBinMKE: Are most of your photographs taken Cartier-Bresson style as you see women on the street or do you set them up ahead of time? Its a mix. About 20% are people I snap on the street. I usually try to ask their permission and get their email so I can get a description of their bike and a cycling tip. Sometimes they prefer to remain anonymous. The other 80% I meet on The Chain Link, Lets Go Ride a Bike , and through Facebook posts, friends, friends of friends, and friends of other subjects. OTBinMKE If you schedule the shoots, do women seek you out and volunteer or are you always on the prowl for subjects? I seek out volunteers, and I usually prefer that because the subject is able to pick out their favorite biking outfit, and they feel confident and comfortable. It doesn’t have the same thrill as finding people in their natural state. It puts a lot of control in the hands of the subject, which I like because I want to take flattering photos of women when they are feeling their best. That said, I’m always on the prowl for subjects. I keep an eye out for lady-sized bikes at parties, I have accosted helmet-carrying women in elevators, flagged fellow bikers down on the street, and in general acted like a stalker. It’s a bit of an adventure, and very different from the style of photography I do for work, so it feels fun. 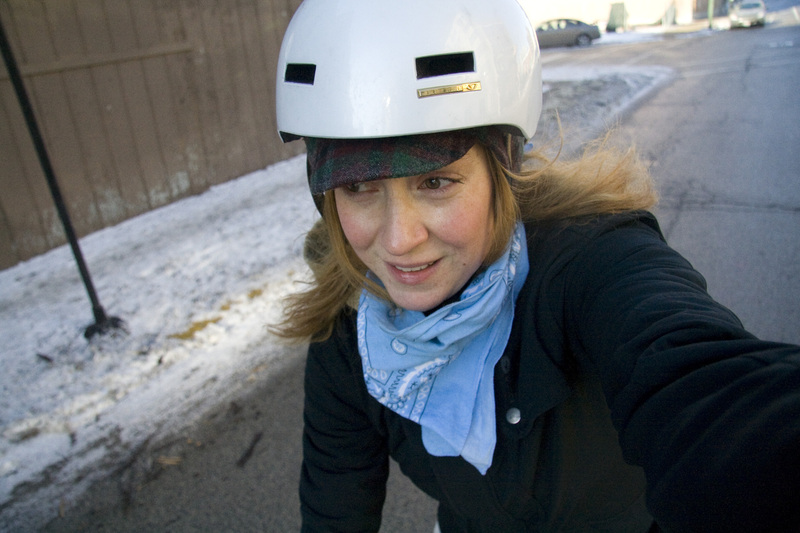 OTBinMKE: Do you have any trouble finding women in Chicago who ride bikes for transportation in regular clothes? Is there an unending (growing) number or do you envision a point when you can’t post every day? First of all, I started this project because I noticed that the numbers of men and women who ride for transportation, in regular clothes, keeps growing and growing. During rush hour, there is actual bike traffic along some of the more popular roads in Chicago. Even winter riding is way up by my estimation. That said, the winter is getting tricky. I’m sure come February I’ll be desperate to find people. I’m getting business cards made so I can just pass them along to commuters and meet up with them later. Not everyone is comfortable being photographed by a stranger, and they refuse, but maybe once they see the site they would be more open to it. Also, I would love to photograph all over the country. Milwaukee and Minneapolis are next on my list of places to visit and photograph, and I plan to squeeze in bike portraits wherever I travel. OTBinMKE As a photographer, are you able to do most of your shoots without a car? So far, I have biked to all of the bike fancy shoots. 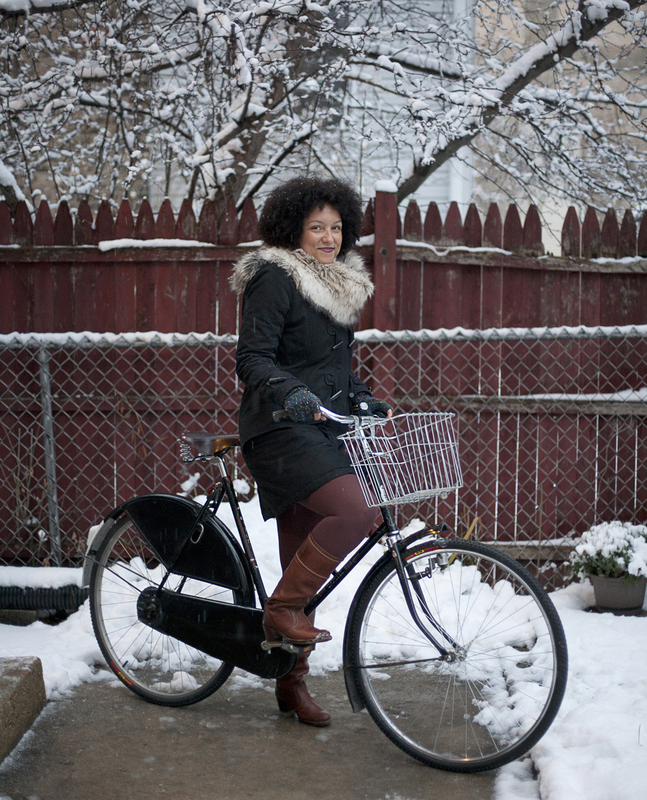 In my role as Associate Photo Editor for Time Out Chicago, I bike to most photo shoots. Sometimes I have to carry a large amount of lighting gear, or I am training an intern, and I will take a cab. I’ve had two interns that also biked, and they rode along with me to assist on photo shoots, which was cool but not that common. OTBinMKE What bicycle(s) do you ride? I have a 1987 Pink Schwinn Prelude that I’ve had for 8 years, and keep fixing up. Great photos (although your “Mrs. Claus in heels on a tandem” shot is my current fave). This would be a fun Milwaukee project; I know a few candidates for your project and would be happy to spread the word. Thanks d’Andre, I would love any help finding people you might offer. And if you have any other ideas on collaborating with me, I would certainly appreciate your perspective.